Well, I’ve had more than a few weeks to get moving on my Ysolda Teague Knit Along project and I’m still only 20 rows in….this is a problem. It seems some motivation is in order so: Party time! 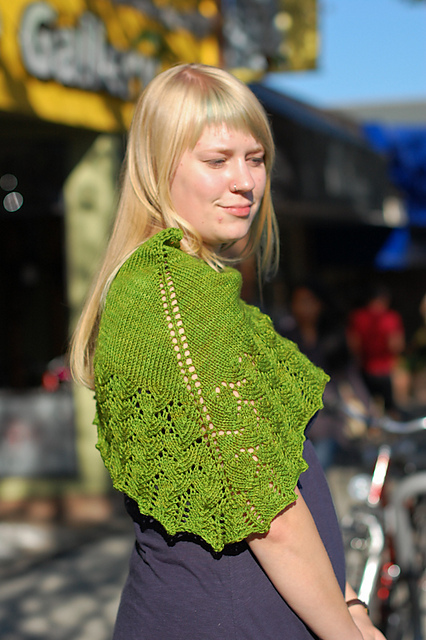 The first Friday in October, (the 7th) will be our official Ysolda Teague KAL party day. There will be tea and cookies, photos, and most importantly: show and tell! Kynna has already finished one of what seems to be an endless supply of Ysolda knits: her Ishbel. I’ve knit this pretty little shawl twice, both times using some Handmaiden Casbah, a soft and gorgeously coloured sock yarn. It’s rare to say, but I just might make yet another some time soon, the results were just that good. Kynna knit her pretty little Ishbel (which she has aptly named Woodland Nymph) out of Fleece Artist Merino 2/6 held doubled. Doubling the yarn makes for a thicker and slightly larger shawl. This entry was posted on Friday, September 9th, 2011 at 1:09 pm	and is filed under Uncategorized. You can follow any responses to this entry through the RSS 2.0 feed. Both comments and pings are currently closed. Sounds like a great way to kick off the long weekend to me!